Circuit training has been around since formal exercise was created. It is a great way to move your clients around a variety of equipment and exercises while keeping them under control. There is one problem with typical circuit training though. It can be really, really boring. Doing bicep curls with a band for a minute and then moving to the next station and doing squats for ANOTHER minute gets a bit tedious. Meanwhile, you, the trainer, are watching the stopwatch and trying to keep an eye on 12 stations at once. Eyes in the back of your head, you do need young Padawan. Instead of doing it the old way, try out some of these methods that I’ve used with success to keep your clients focused and moving. This one helps you keep your eyes on the client, rather than on a stopwatch or timer. Give one station a set number of repetitions. Once the client on that station completes all repitions, they call out ‘SWITCH!’ and it’s time to rotate. Clients on the other stations simply keep doing their exercise until they hear the word. This giant circuit workout is an advanced use of the timekeeper method. I pinched this from one of the Bootcamp Alliance workouts. This works similiar to the time keeper station except that instead of repetitions, clients must run a certain distance. You can either have them run around the circuit or run to a point and back. If you have several clients on one station, you can increase the interval time by making them do the run one a time. The round is complete once all clients on that station have completed the run. In this case you would also assign an exercise to that station for the clients not running (see diagram under the hunter circuit). I used this on the 3rd circuit of my 1 hour circuit workout. This one you are probably familiar with now from my mini circuit bootcamp workouts. To keep the intensity up, reduce the number of stations to 4 or 5 so your focus isn’t spread so far. Jump in with a group and set the pace. Then move onto another group and get them going again. Use variety with your timing. Do a round of 60 seconds, then a round of 30 seconds, then 20 etc. The only downside to this is that you will need more equipment. Another intensity technique from the Bootcamp Alliance. In this case only have 3 stations and you will employ the timekeeper method on one station. You can set up the stations in a triangle or in 3 lines. Sort the campers into teams of 3 (one on each station) and have them compete to finish 2 or 3 rounds first. Teams rotate once their team member on the timekeeper station completes all of their reps. Check out these 3 person circuit workouts. For this you will need more stations than campers or you will simply need to group (pairs or triplets work best) them up on the stations so that some are free. Each station either has a repetition limit assigned to it or if you have a group on a station you can work on your clients CV endurance by making each camper run around the circuit one at a time. Once all clients on a station have completed the reps or laps the group must move in a clock wise direction around the circuit to the next available station where they repeat the process. First group to finish 5 (or 6 or any number) stations wins. You can apply this to nearly any group circuit workout. These five circuits have since been expanded on and included in The Little Bootcamp Book of Workouts. The Little Bootcamp Book of Workouts also features dozens of other tips and workouts to help you create your bootcamp workouts faster. It includes 19 done-for-you workouts to get started. Check it out. 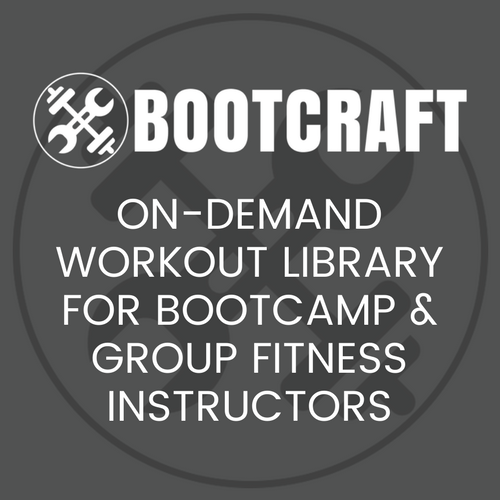 If you enjoyed this post or found it useful, sign up for regular bootcamp drills and workout ideas for free via our RSS feed or email updates. Another thing I do with my Bootcampers is give them an AMRAP of 8-10 minutes at the end of their workout. Using upper body, lower body and core. 3 movements using 5-10-15 reps. Just to leave them totally gassed at the end of each session. Walking away saying to me they cant wait to see me again. If your clients are after written progress reports, write down their score and do it again in 2 months. Watch their faces when they see the change in scores just after 8 weeks. Client retention is our biggest enemy. Using this system has helped me keep my clients, I hope I can help others do the same. Thanks Leigh. Yes client retention is super important if you don’t want to spend your time constantly looking for new bootcampers. Thanks for sharing with us! Hi i’m a personal trainer and i run bootcamps a lot of what i do is circuits like above, i am very interested in new idea’s and was going to purchase your book but my problem is this i cant make out what your trying to explain from your diagrams and explanations. The 3 or so drills above look very interesting and kinda in the line of what i teach in my bootcamps but i cant make and sense of what your trying to explain. Thanks for having a look through the ideas. Could you be more specific in what you can’t make sense of? I’m not sure I could explain it differently without showing you face to face. Sorry Kyle i worked it out it was the hunter circuit i was a bit confused about but worked it out and i actually used it this morning in my class and it went very well thanks.. Is there a book or just a e-book and is there more circuits like this in it , i like to change the workout everyday as much as i can but ideas are starting to run short. Hi, this is really good, I am a Personal trainer and Bootcamp instructor in Cardiff. ( http://www.achievingfitness.co.uk ) I am going to try this time keeper lap around the circle thing tonight! Thats my new name for it anyway. Cheers for all these resources I find them absolutely fantastic and regularly use them!